lets through less "silt" than a paper filter. material with no bleaches like paper filters or fiber surface as in a cloth filter. Reusable - long life filter. 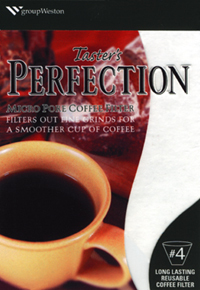 Taster's Perfection is a unique new product for coffee drinkers looking to brew a better cup of coffee. 1. Return item(s) has to be unused and in an original package and sent back with copy of original invoice. 2. Shipping charge is not refundable. 3. Return item(s) is subject to a 10% restocking charge and item(s) must be returned within 30 days from the date of purchase. 4. Customer is responsible for return or exchange shipping charges.